In the morning, we prepared to go to Anak Krakatoa Island. 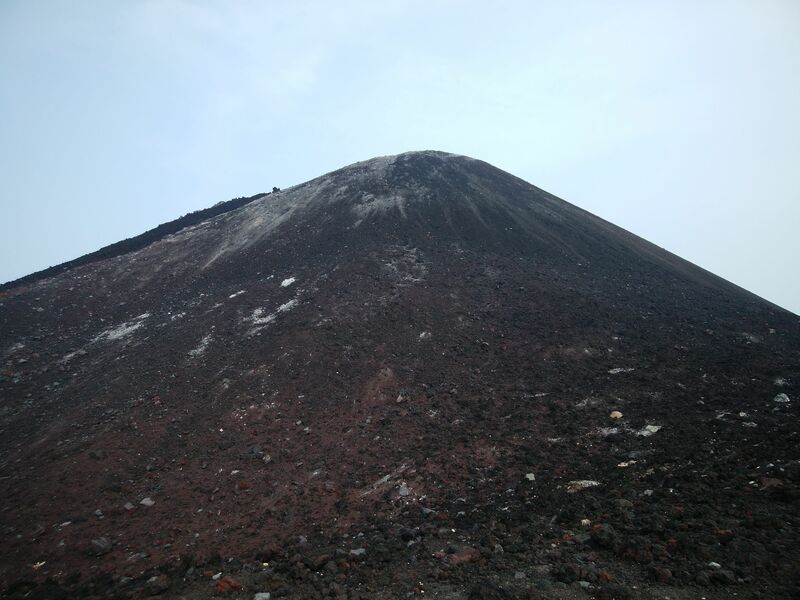 Before, the guide said that we must get up early because of visiting Anak Krakatoa Island in the morning. After preparing the things that we wanted to bring, we continued our trip by some boats. 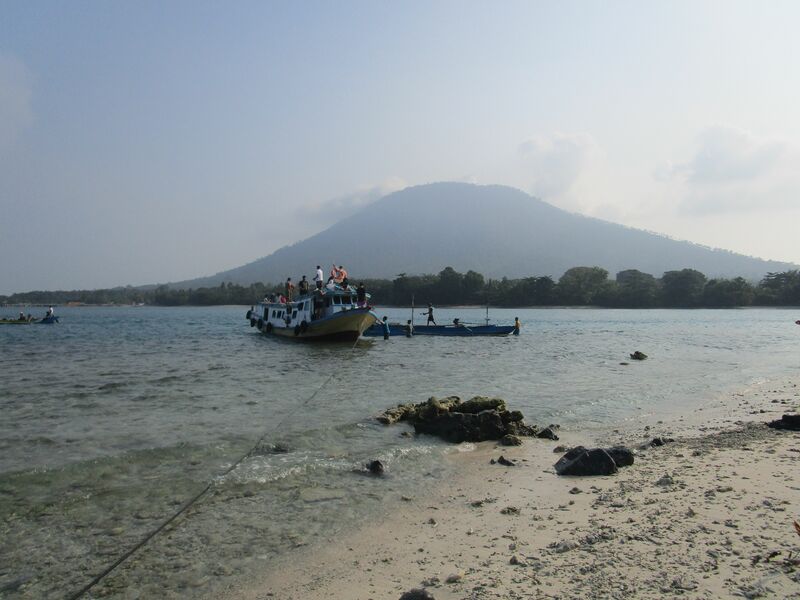 After almost one hour, we arrived on Krakatoa island area. From many source, we know that Anak Krakatau or “Child of Krakatoa:, merged from caldera formed in 1883 and it is the current location of eruptive activity. My friend said that there are a lot of sea cucumers in Lampung. But she was not mention the place detail. Now, I know about the place, it is Umang Island. A little island closed to Sebesi Island. We visited this island in the afternoon, from Sebesi Island it takes less than 20 minutes. This island is protected by government. I think because there are so many sea biotas live here. After jumping into the sand, we can see beautiful scenery with white and soft sand, a lot of coral reef and stones, green tress, and crystalline sea water with its gradation. I expected of visiting a few islands in Lampung although I have been there before. I went to Pahawang Island and a few islands around it. 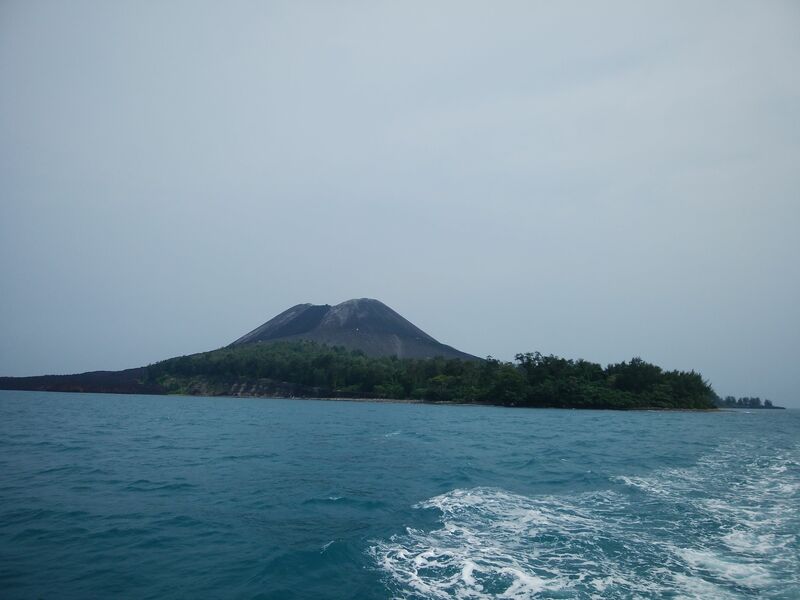 But I interested in Anak Krakatoa on Anak Krakatoa Island, I hope I can go to the island someday. Finally, I got the time to visit that place. My friends, my husband, and I went to Anak Krakatoa Island. We took an open trip to go there. First, I want to tell you about two islands near from Anak Krakatoa Island; Sebuku Island (Little and Big Island) and Sebesi Island. We started out trip from Canti dock. It takes more or less 1.5 hours. We visited Sebuku Island for e few minutes, just for took some photos. 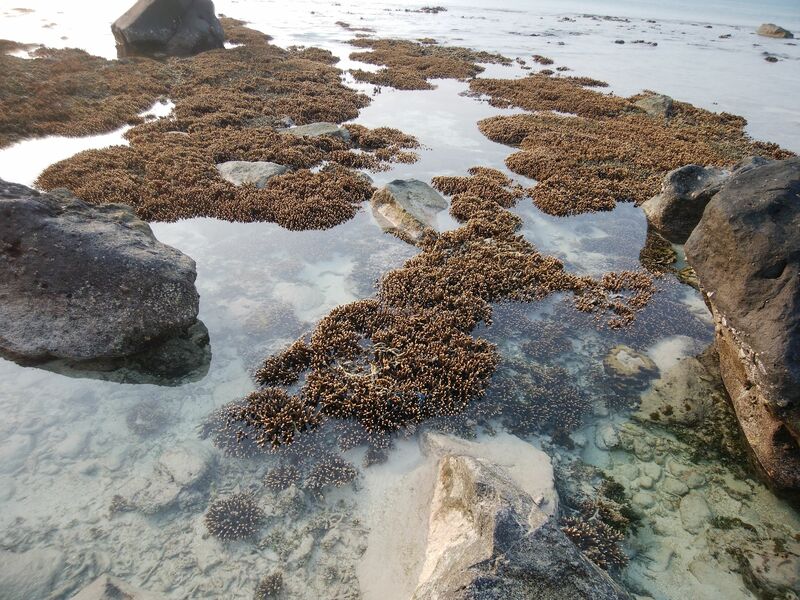 This island is coral island because there are a lot of coral reef on the beach or its shore. 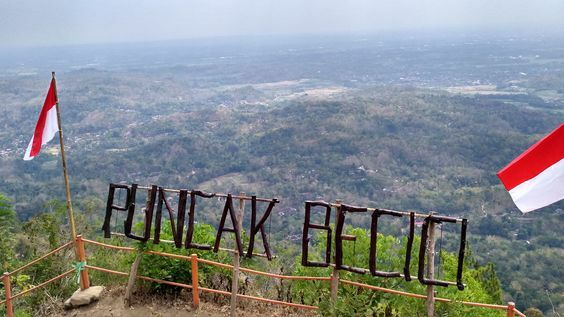 Concept of Watu Goyang is slightly different from concept of Puncak Becici or Songgo Langit, but the place offers nice view same as them. We can see Yogyakata view from the top area and there is a big stone there. People called the stone as Watu Goyang, Stone Swaying in English. There is a stone that sway on top of a hill. If we touch the stone, it will be swaying. 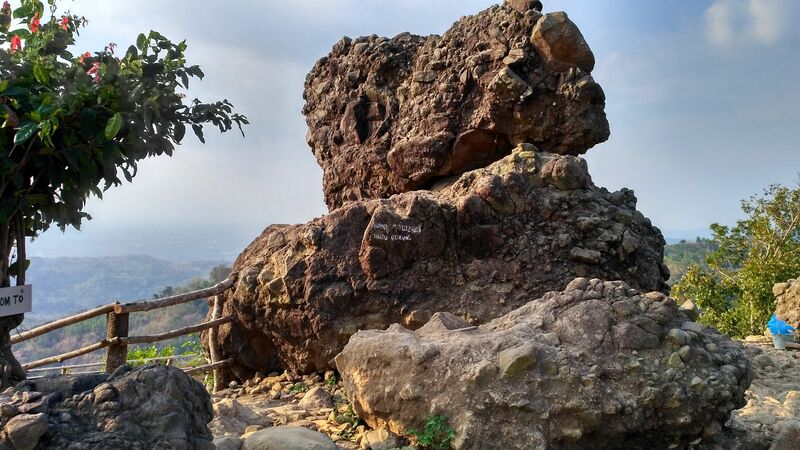 From the swaying stone, we can see beautiful scenery of Yogyakarta. 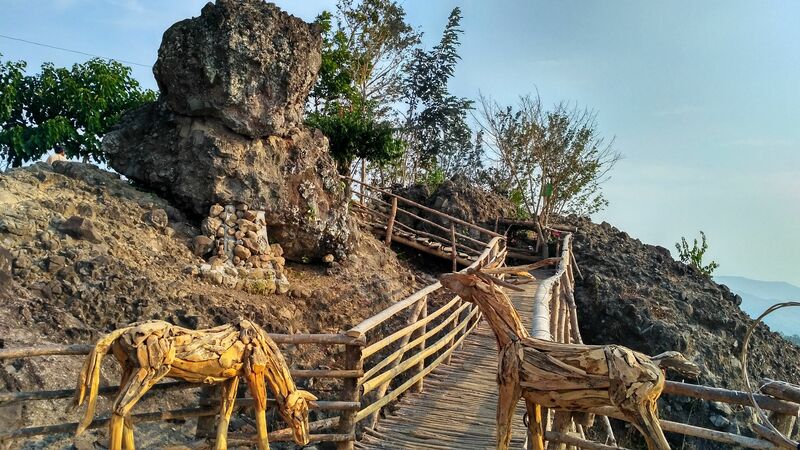 At the area, there are deer statue made from wood. It is cute. 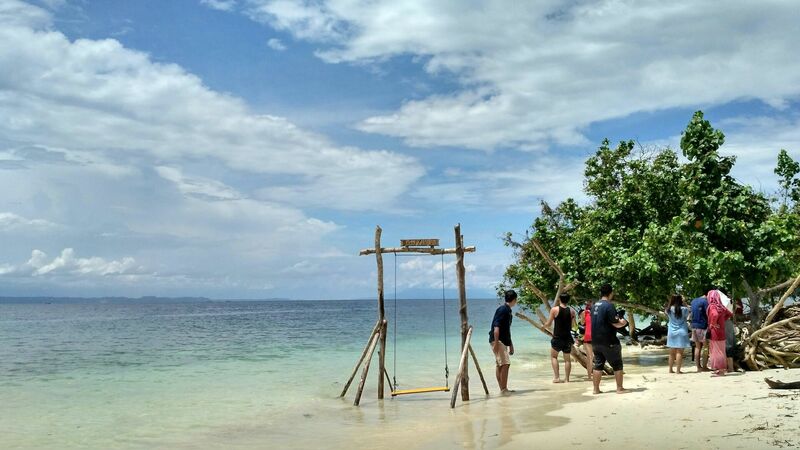 Pulau Pahawang is one of beautiful island in Lampung Province. It is located at Marga Punduh, Pesawaran regency. My friends and I went to this island from Jakarta. We took open trip package to visit this island. First, we go to Merak port by my friend’s car and continued by ship. Before it, we might be waiting for another people who took open trip too. We waited for more than 5 hours. It so bored but we need to refresh our mind and we have chosen this trip. 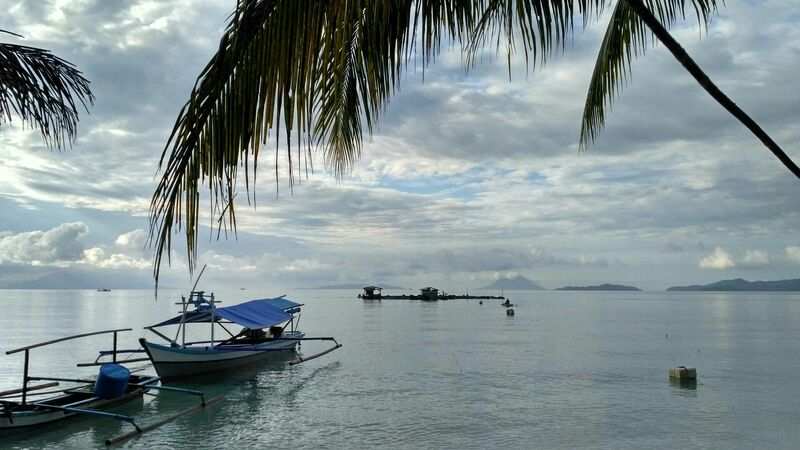 Pahawang Island is nice island with its local communities. First, we did snorkeling on sea near Pahawang Island. What we can see into the water? 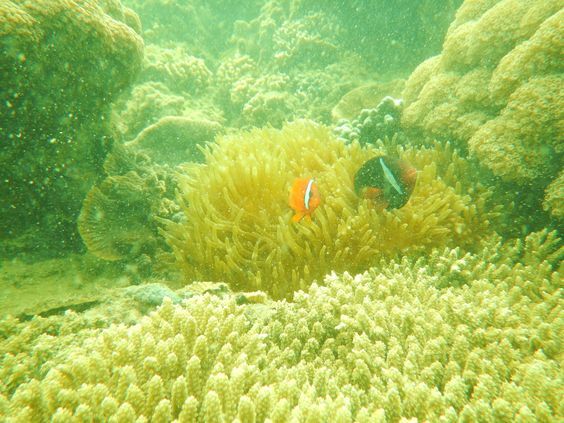 We see some sea biota; nemo, several fish types, crab, and also sea urchin. There are a lot of sea urchin, big or small. It is so scary but it is so beautiful. 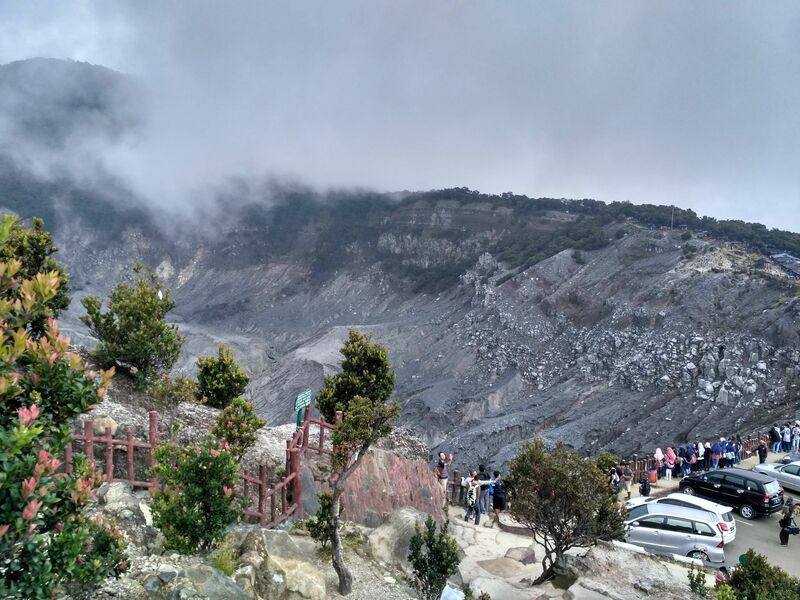 After we had gone to another place, we visited a place in Tangkuban Perahu area. My husband interested in flora at that area. We entered the area and tried to know about that flora. 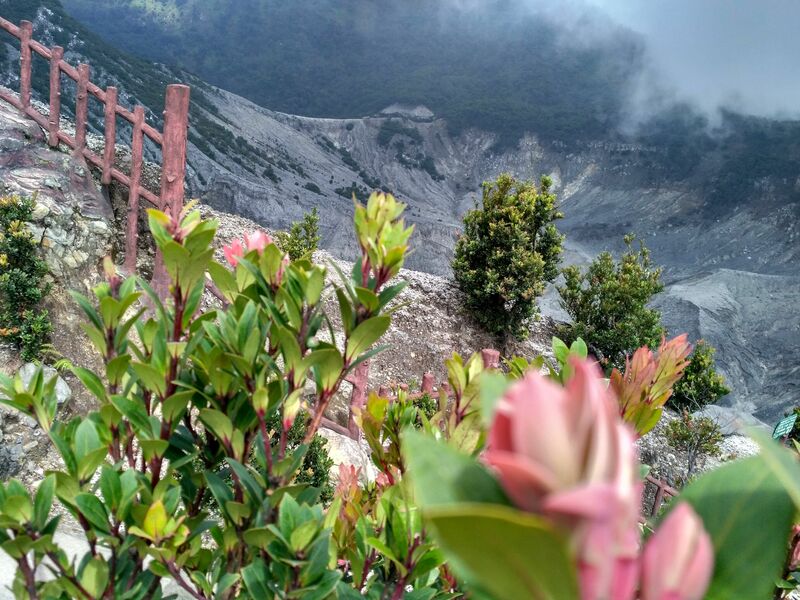 TWA Mount Tangkuban Perahu is the location of this flora. 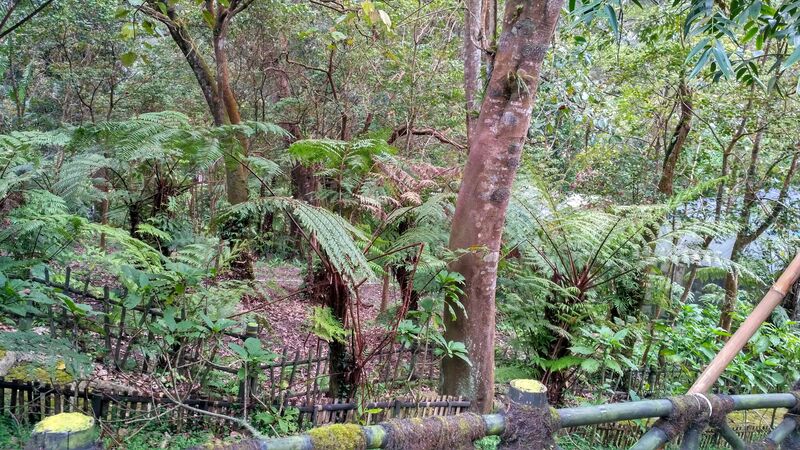 There are few samples type vegetation of Mount Tangkuban Perahu. Such as orchids, planting by 55 states from around the world, and many more. 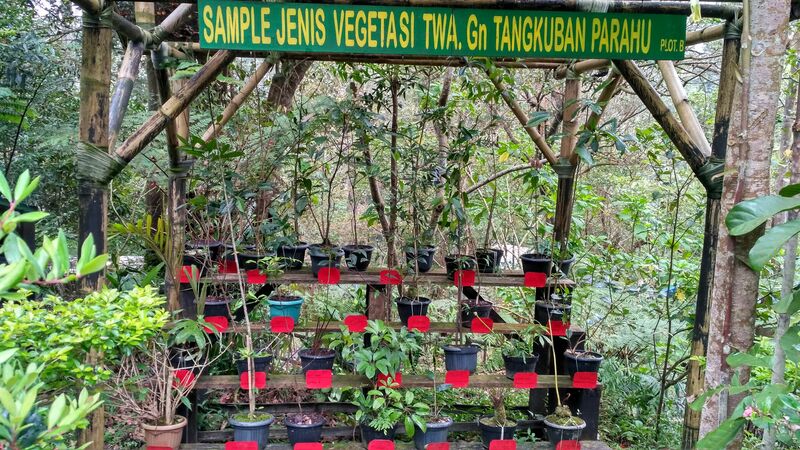 Base on website TWA Tangkuban Perahu, there are Cantigi (vaccinium varingiaefolium) is flora of Indonesia that dominate the area of this mount. 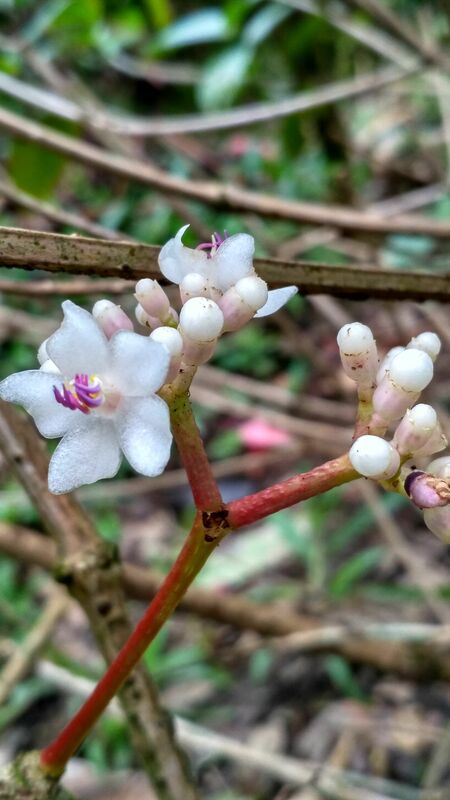 We can see this flora around Ratu crater and Domas Crater. 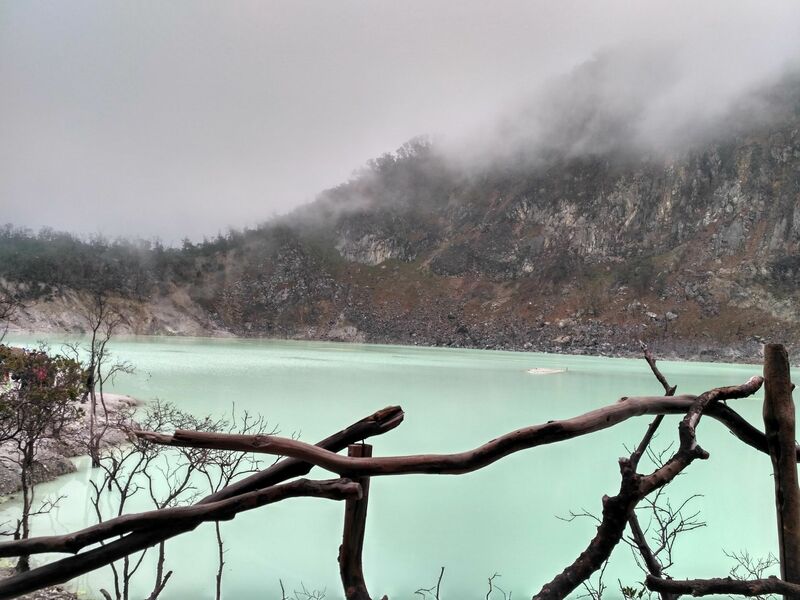 Kawah Putih, in English White Crater, is a nature tourism in Ciwidey, West Java. 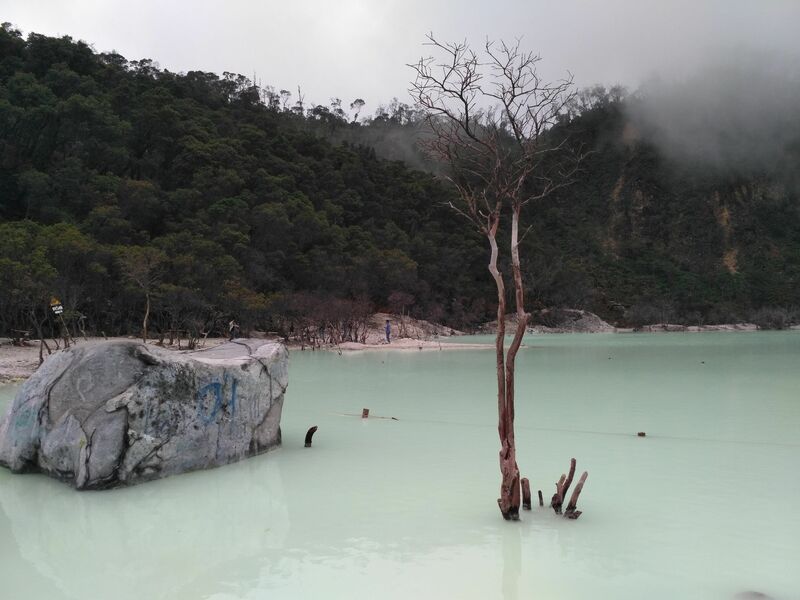 It is more or less 50 Km from south of Bandung City. 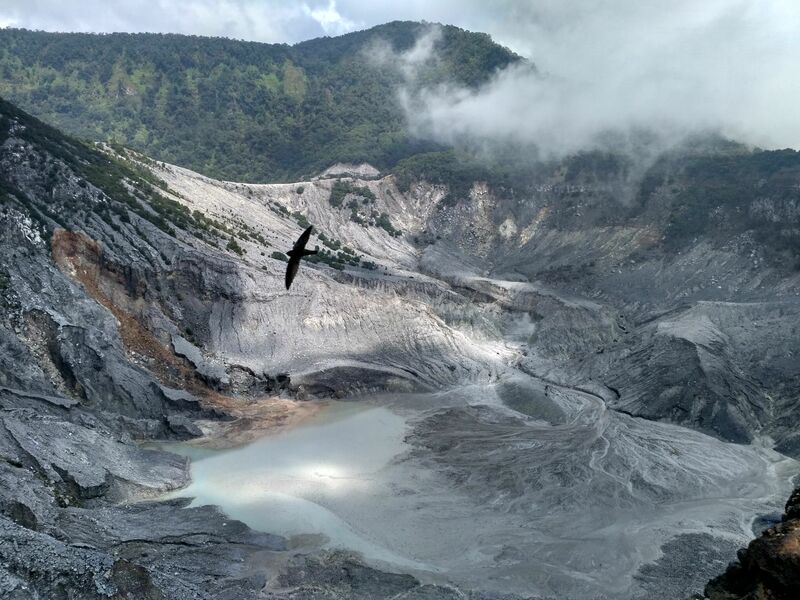 White Crater formed from eruption of Mount Patuha. In this area, its soil and water lake are white. 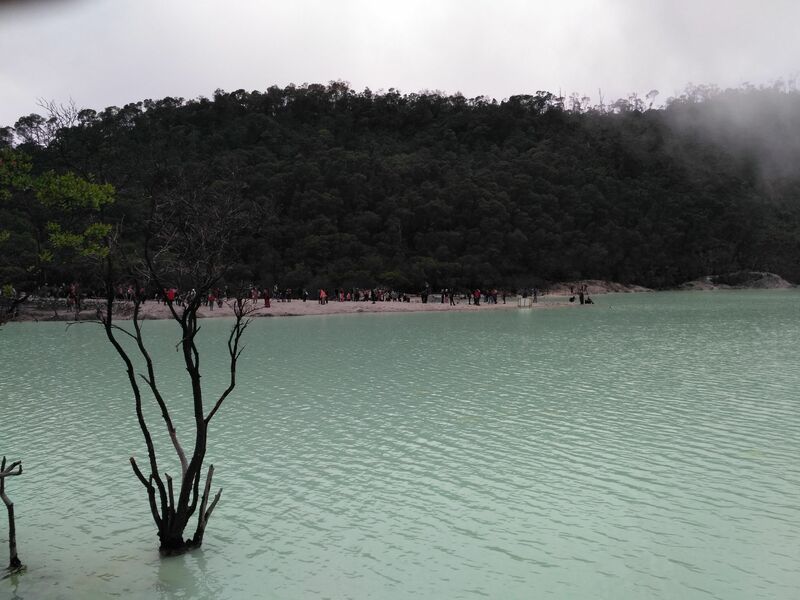 From many sources, the water lake is white greenery and can change color in accordance with the levels of brimstone, the weather, and the temperature in that area. The weather in that White Crater is so cool, it is because the crater is located on mountains. So, if you want to visit this crater, you must bring jacket or thick and warm clothes. There are a few plans and tree around the white crater. 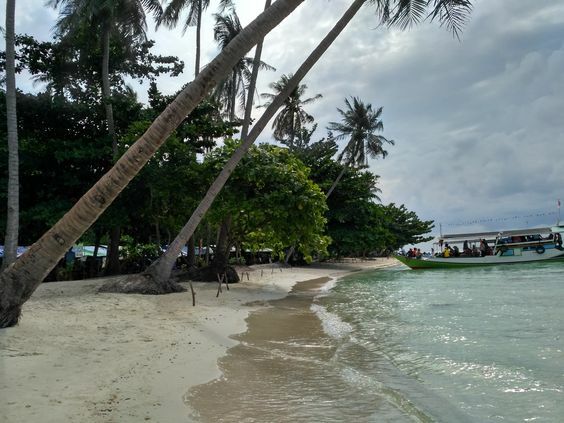 Karimunjawa is nice Islands can attract people to visit it. One of them is nature scenery. 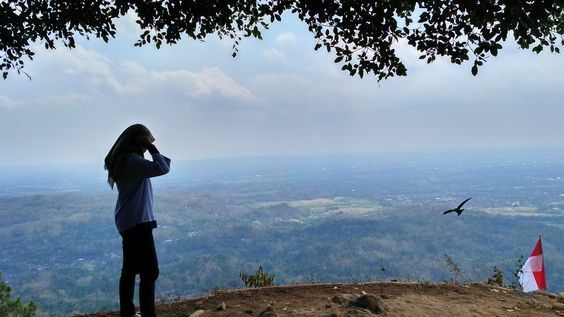 After taking many photos at Bukit Love, we continued our trip to an area called Joko Tuo hill. It is a hill same like Bukit Love. We must go upstairs and find the top of this hill. 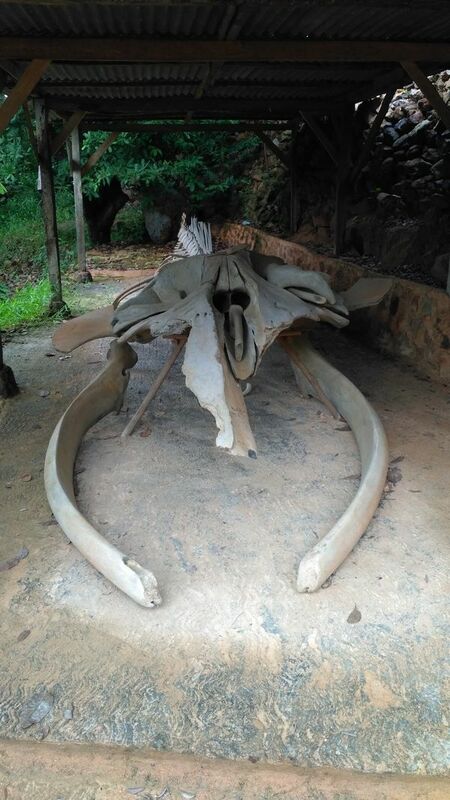 Before we arrived, we met a large fish-bone. We asked each other, what is this? It is original or just replica. I have no idea with this place before. But when my friends and I visited it I knew that the place is an instagramable place. Basically, I don’t like a place which build to attract people just for taking photos. I think natural scenery is more interesting than a place has been built for taking photos. But, I do not know why, today it is so popular. I try to think in positive mindset. This action not only for people who crazy in selfie or Social media phenomena but also about local community. This action can give income for local communities, although we must be careful for our nature. Okay, my friends and I went to this place in the morning before we went back home. We visited Bukit LOVE. This place is near from main area of this island. It is about 5-7 minutes from our inn. What can we see in this area? Hills with LOVE word-stone. 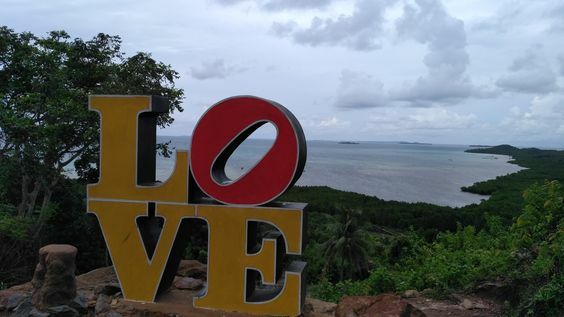 Yes, people built a word ‘’LOVE’’ from cement on the hill. 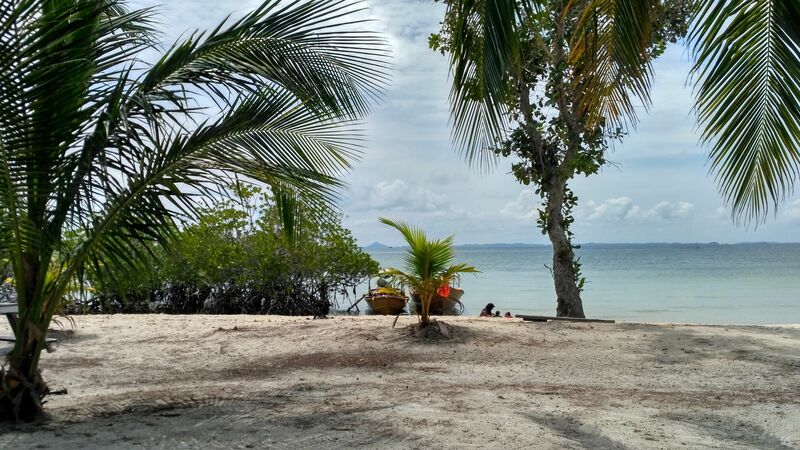 From this spot, we can see beautiful scenery of Karimunjawa sea. Love it, it is exquisite! 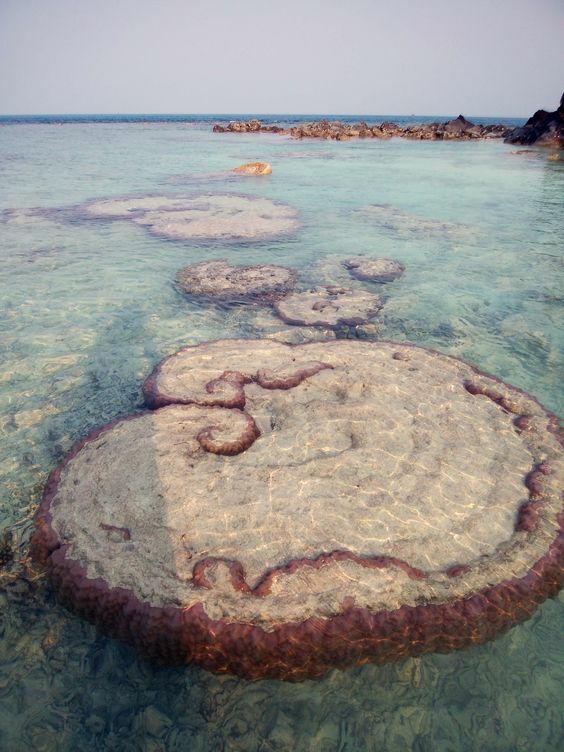 Besides LOVE stone, we can find Karimunjawa word-stone. It is like Love word-stone. The beauty of Karimunjawa is inexhaustible. One of them is Ujung Gelam island. Smooth white sand and nice spot are interesting offer from this place. 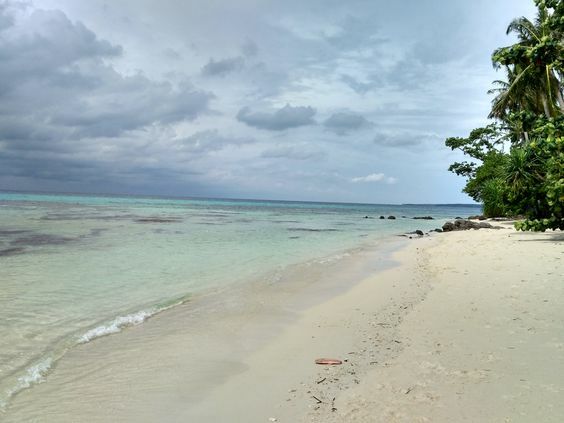 We can reach this place 40 minutes from Karimunjawa. People says that Ujung Gelam Beach is good spot to enjoy the sunset. But, we did not get the sunset because the weather was not good. We had to go back to Karimunjawa island, place where we were live in. This place offers some nice spots. The first destinations we visited in Karimunjawa is a shark breeding on Menjangan Besar Island, Karimunjawa, Central Java. We set off from a dock on the island Karimunjawa with a ship. After about 10 or 15 minutes, we arrived at an island. We then got off the ship. Previously, we were asked by the manager of the place was on who would enter. Each incoming visitor must pay the entrance fee to the sharks breeding place. There are two big enough pools in the area. In those ponds, there are a few little sharks. Visitors may enter into the pond and take pictures with the sharks. But there are some rules that must be followed by visitors. There are five things that must be considered by visitors as abstracted from the pages of Kompas travel. Part of it was also informed by the officer at that place before the visitors went into pond. Feeling tired after a long trip from Palangkaraya, Sampit, up to Pangkalan Bun did not make us lose our spirit to go to Tanjung Puting National Park. Great curiosity towards Orangutan in the national park has defeated our fatigue. After all of our jobs completed in Pangkalan Bun, we immediately headed the port in Kumai. 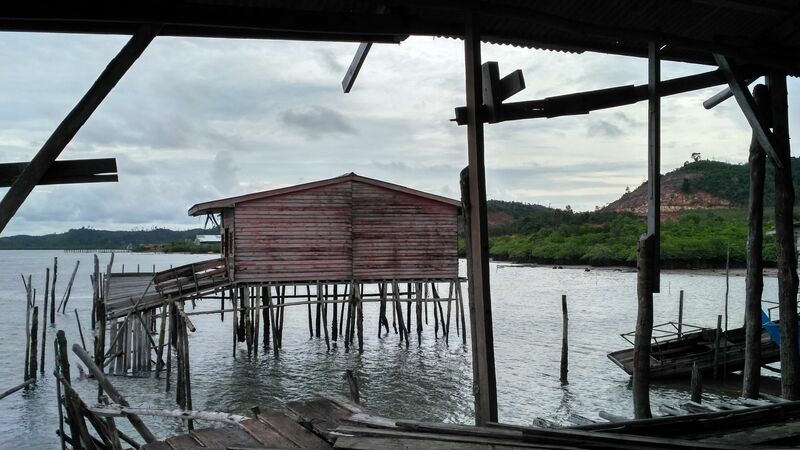 We plan to visit three locations: Tanjung Harapan, the second camp is Pondok Tanggui, the Third Camp is Camp Leakey. But we miss a location, Tanjung Harapan. We miss Orang Utan feeding time at 3 o’clock. It because our job did not complete yet. Although our tour guide had called us have been many times but because we have not finished the job. 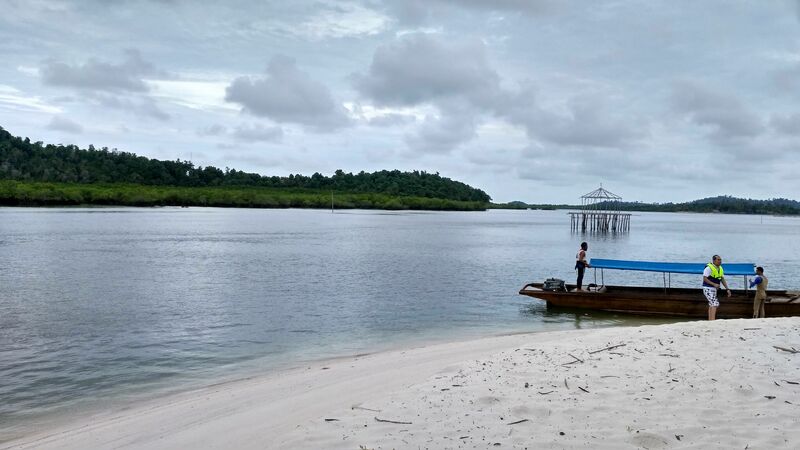 Tanjung Puting National Park is a national park located in southwestern peninsula of Central Kalimantan Province. Administratively, the national park is located in Kumai district, West Kotawaringin regency and in Hanau District, Lake Sembuluh, and Seruyan Hilir in Seruyan Regency. Kalimantan or Borneo is my childhood dream. Kalimantan so fascinating for me. If I ever have a dream to go to Anambas Islands for 7 years. Kalimantan, I’ve dreamed it when I was elementary school. I do not know what attracted me to the island. Maybe because I am a Sumatran and also we have a large forest. So, I hope to see the forest more dense than in my region. I was not struck by a multistory building or the bustle of the city, but I was fascinated by the dense forest or the countryside. People say if we’ve been to Kalimantan, then we will come back to the Island someday. And all of my friends and I had been to Kalimantan, finally we come back to this island for different reasons. I’ve been to Palangkaraya – Central Kalimantan few months before the trip begins. I had a job there. At that time, I was very happy but I did not have time to look at the region more closely.And now, I come back again to Kalimantan. I will start my trip with my friend. Our trip started from Tjilik Riwut airport in Palangkaraya and continued to rent a car to our destination in Sampit and Pangkalan Bun. Palangka Raya is the capital of Central Kalimantan, the city is located between The Kahayan River and Sebangau Rivers. The first our President, Sukarno, initiated construction of the city of Palangka Raya as new capital of Indonesia to replace Jakarta. A proposal that was discussed until recently but we do not know when it comes true. Curious about a tree on a beach that is being famous at the Instagram makes me want to see the tree directly. Not because the tree is well known at the social media, but rather on the natural beauty that served in the beach. Pok Tunggal Tunggal that’s the name of the beach. A white sandy beach with typical karst rock and fortified by towering karst rock. This beach is located at Tepus village, Tepus District, Gunung Kidul Regency, Yogyakarta. As other beaches in Gunung Kidul, the waves are quite high and is not allowed to swim. In addition, charming karst rock hill attract us, my husband and I too, to climb up the hill. We use ladder to go up the hill. Those ladders have been made. The hill is quite high and should be careful. Having reached the top of the hill, we could see the beach and sea widely. Wonderful! the right word to describe its beauty. The thing I like there is red and white flag fluttered. Feels proud to see our flag as proud to see Indonesian nature. Thanks to God for the natural beauty of Indonesia, may we always be able to keep it. Gunung Mas Agro tourism, what a green the place! If I have ever told you about the tea plantation in Pagar Alam, South Sumatera. Today, I’ll tell a little bit about the tea plantation in Puncak, Bogor, West Java. we visit the area Puncak, Bogor, West Java. As far as our eyes can see, we will be treated by green tea plants. Cool, fresh, and charming, those were the words that can describe the area. I’m very interested in cherry blossoms. I tried to find about the cherry blossoms on Internet. I found that in Indonesia there are some places that there is cherry blossom tree. 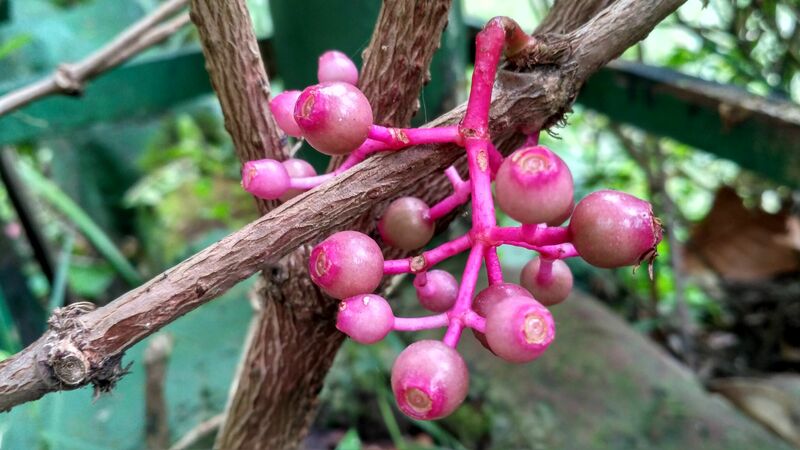 At Cibodas Botanical Garden is one place that there is a cherry tree. I’ve been wanting to go to these places, but only a few months ago, I had the opportunity to go there. But when I went there the cherry blossoms do not bloom. What I have found only a few trees are still there was little interest. Actually, it was enough to make me happy. It was better than nothing at all to see cherry blossoms. When we were in Batu – Malang after completing the outbound event, we have time to rest until dinner time. One of our friends, invited us to visit one of the waterfalls in Malang. Local people call the waterfall as Coban Rondo Waterfall. In the Java language Coban means waterfall, while Rondo Means Widow. There is a legend that underlies why the name of the waterfall as Coban Rondo. Once upon a time, there was a couple who will visit her husband in-laws house. But on the way, there is a man who is interested in the women. The husband then hid his wife in a waterfall. Then the husband fighting with a man who loves his wife. But, both of men were killed in the fight. The wife who was waiting at the waterfall and then became a widow because her husband was killed. That’s why the waterfall known as Coban Rondo. If we have a plane to visiting Malang. Don’t forget to visit Museum Angkut. We can see a lot of vehicles from traditional to modern transportation. Beside that, we can take some interesting and cute photo at those vehicles. 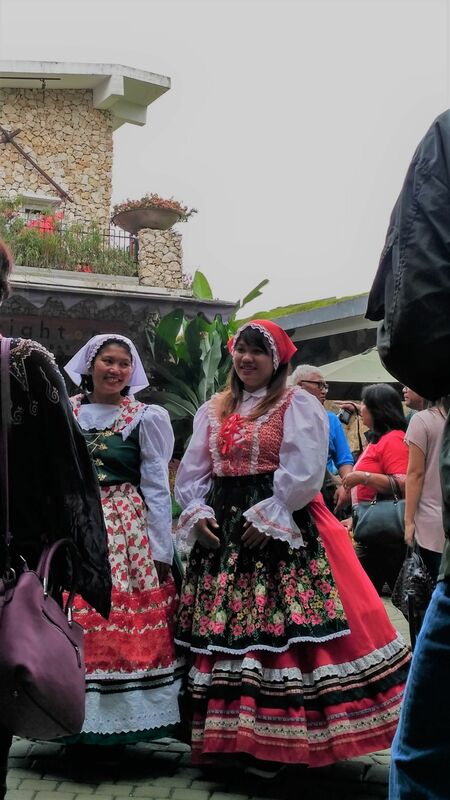 We can see European atmospere at Museum Angkut Plus Movie Star Studio is the museum with the concept of education and entertainment that is displayed Directly. 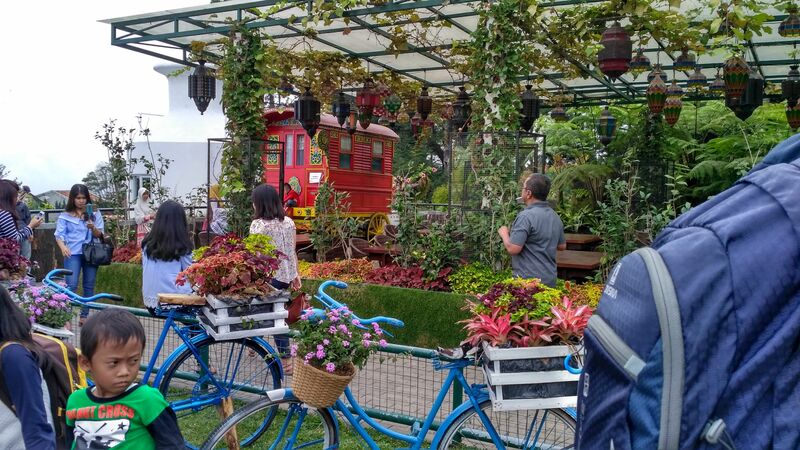 This museum is the first museum of transportation in Indonesia and in Asia. The museum is built on March 9 2014. Museum is located on the slopes of Panderman mountains. It is at Jalan Terusan Sultan Agung No. 2 Ngaklik, Batu Regency, Batu, Malang, East Java. 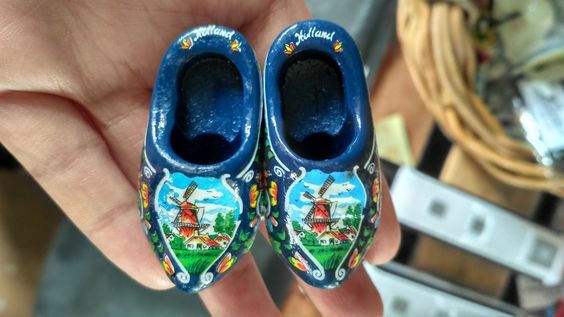 The museum has more than 300 collections; Traditional transpotation to Modern Tranportation, European and America Lanscape with femouse building, Superhero statues, and many more. The collection is divided into several zones: Education, Sunda Kelapa and Batavia, Japan, European Union, Hollywood, and Gangster & Broadway zone. If we have gone to Kalimantan, we may often see floating markets. That’s because kalimantan has many rivers and streams are the lifeblood for the people of Kalimantan. What if the floating market at Kota Batu in Malang. 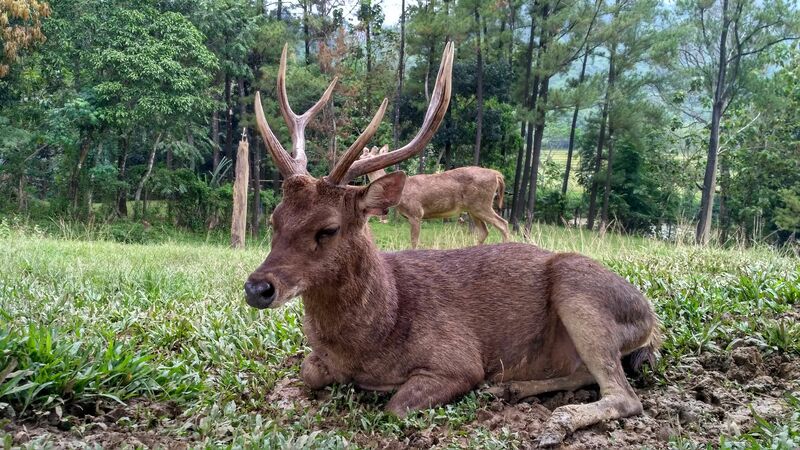 Kota Batu is identical to cold air and an attractive natural scenery. Yup! There is a floating market in Kota Batu. We could call it ‘Pasar Apung’. 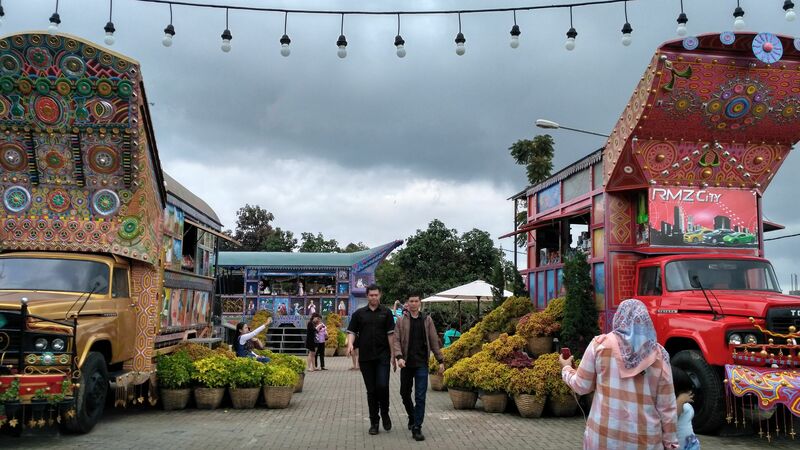 This place is one of the tourist attractions in Jatim Park. This market is part of Angkut Museum. This place has a beautiful view along with Interesting snacks and souvenirs stands. After lunch in Palmatak, we continued our last trip to Air Sena. It is a place for breeding fish napoleon. Napoleon fish worth considering. One kilogram rewarded more than one million rupiah. This breeding of Napoleon fish is located in Air sena village, District of Central Siantan, Anambas Islands, Riau Islands. Napoleon is a type of reef fish. Latin name Cheilinus undulatus or called humphead maori wrasse. Ketipas is familiar name of napoleon fish. Local communities call it. In Air Sena Village many people who breed the fish. Our stomachs were growling will be filled soon. Love it. 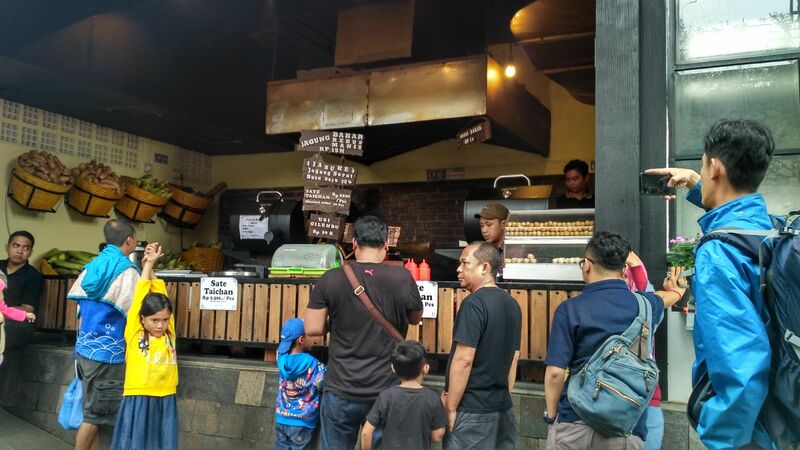 Eyster took us to a place to eat, Pondok Lembayung. Pal Matak or Palmatak, I am confuse about it. Palmatak is a regency in Anambas Island. It has 73 islands with 4 big islands. Palmatak districts located in Matak Island, in Tebang Ladan village with the central government in Tebang Ladan. Palmatak is probably the place that is always there in my dreams besides Tarempa. This is because a research site in a thesis, has made me dream that location. I do not know about Anambas or islands I’ve visited before. I just remember some pictures in that thesis, and the locatios of the pictures are in Palmatak and Tarempa. I observed all the places I visited in Anambas. I tried to remember the similarities between pictures in the thesis and field conditions. And I understand that I’ve got the locations in the photo, even though not all of them. My dream had come true to go to Anambas. A amazing grace for me. In Palmatak we’re not going for a walk or snorkeling. We just stopped by for lunch. Pity, we could not know a lot about Palmatak, but not a problem. If at any time come there again, call Eyster. This is because her house is in Palmatak. When we talk about Nongkat Island, we will be reminded of Mr. Lahani, a guard of Durai Island. Becaouse there is a cottage owned by Ms. Nina on Nongkat Island. I’m not so sure, but as I recall Mrs. Nina is an employee of Premier Oil, which was manage CSR for sea turtles conservation on Durai Island. She and her family has good relatonship with Pak Lahani. I can see it from some photos of them at Pak Lahani’s house when I entered that house. Pak Lahani told us that Mrs. Nina and her familly is a good person. Dhanina cottage is the name of this cottage, the owner is Mrs. Nina mentioned by Mr. Lahani. By the time we came to the island, there is no one in the cottage. 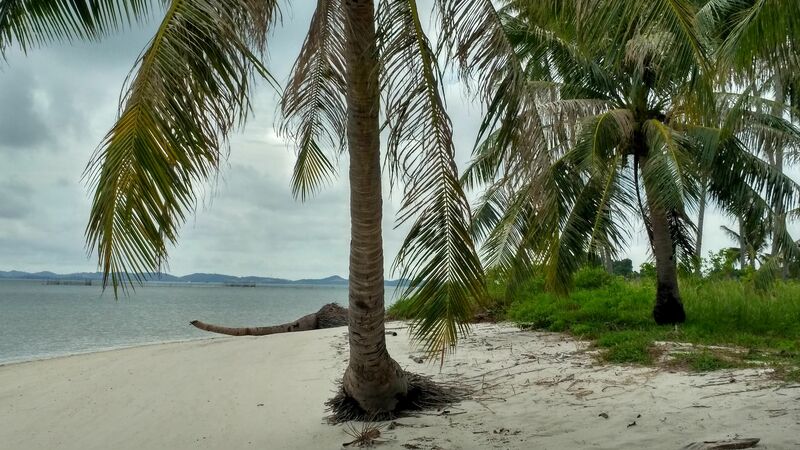 If there is a guard, we must request permission to visit or stop by the Nongkat Island. Penyali Island is the fifth island that we visited. 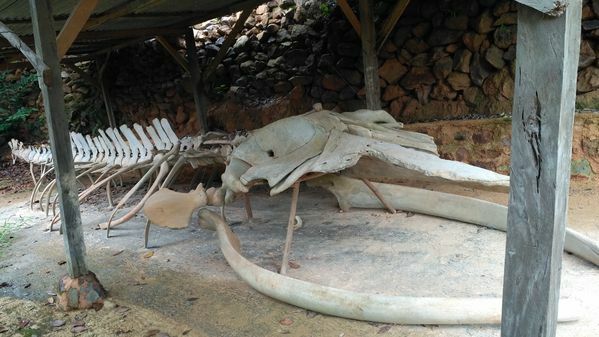 It is located in Tebang village, Palmatak District, Anambas. The island has a variety of plants that are similar to other islands. I think that the island is still natural and there are no people living here. The advantages of this island has white sand is wide and soft enough. The scenery of this fascinating island. If you are a person who likes photography, you will get a lot of interesting photo spots. I like this island and I get a few beautiful photos on this island. We did not do snorkeling on the island, we just took a few photos and play sea water. We also walked a little bit around the island. On this island, we find a few fallen trunks and lay on the beach. It was an interesting spot that is perfect for a place to take pictures. With great enthusiasm, we sailed back after painting memories and experiences on Durai Island. We’re going to Pejalin Island. 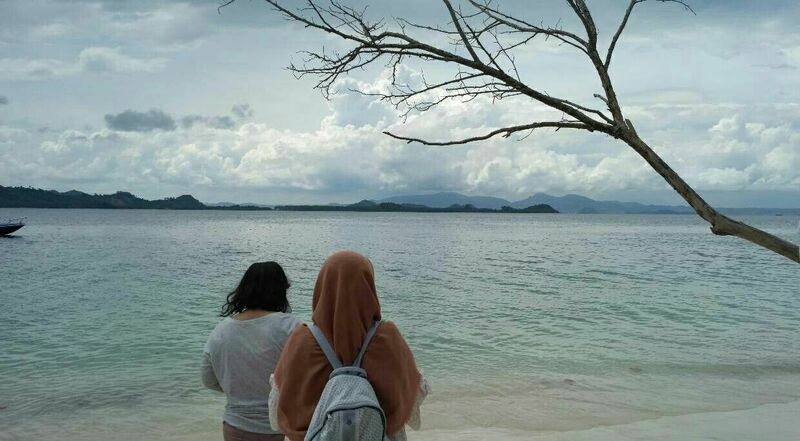 According to Eyster and her friends, Penjalin Island is amazing island. Perhaps it is not as beautiful Bawah Island, but when you’re there may not to go to Bawah Island and it is not big problem. Because of Visiting Bawah Island need much money than the others island. 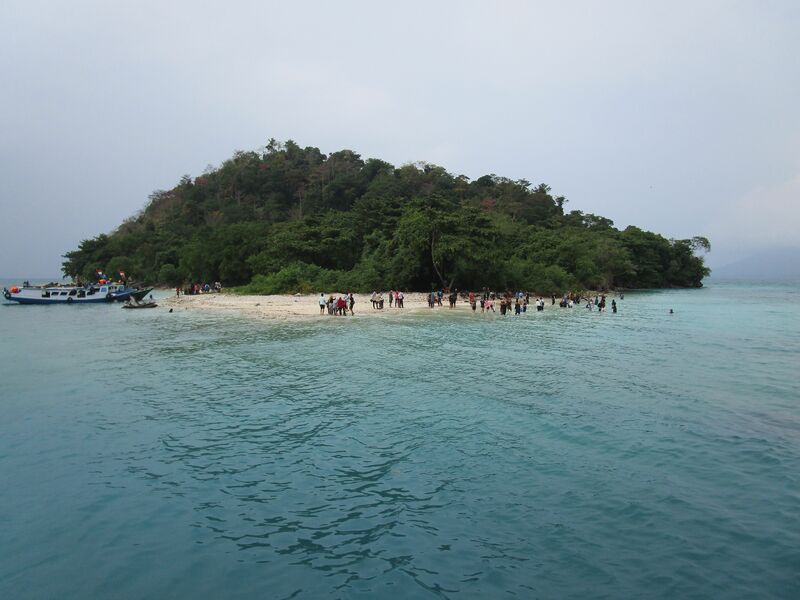 Penjalin Island is little similar to Bawah Island. But, Penjalin is still natural and unpopulated. Besides that, Bawah Island is being built to become the island with luxury resorts. 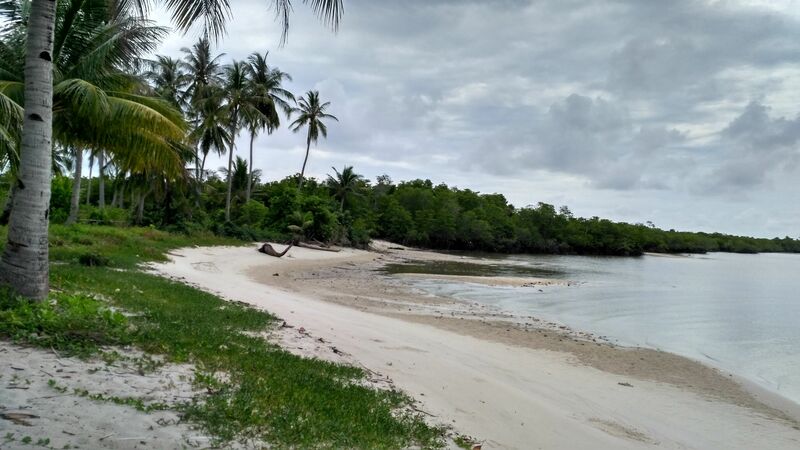 For us, Getting an opportunity to Penjalin Island is an extraordinary gifts from God. Durai Island is the third island that we visited in our trip. 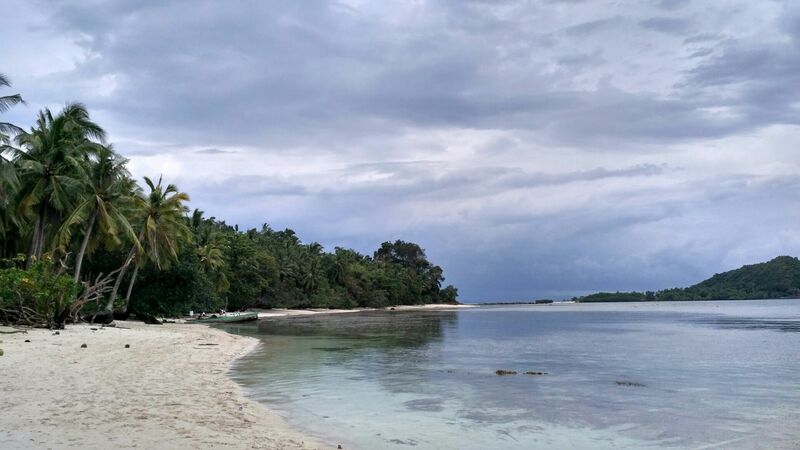 Compared with the previous two islands, Durai Island better known by domestic or international travelers. This is because Durai island is one of the Sea Turtle conservation in Indonesia. To get to Durai Island from Trenggiling Island requires a longer time, perhaps less than an hour if I am not wrong in remembering. 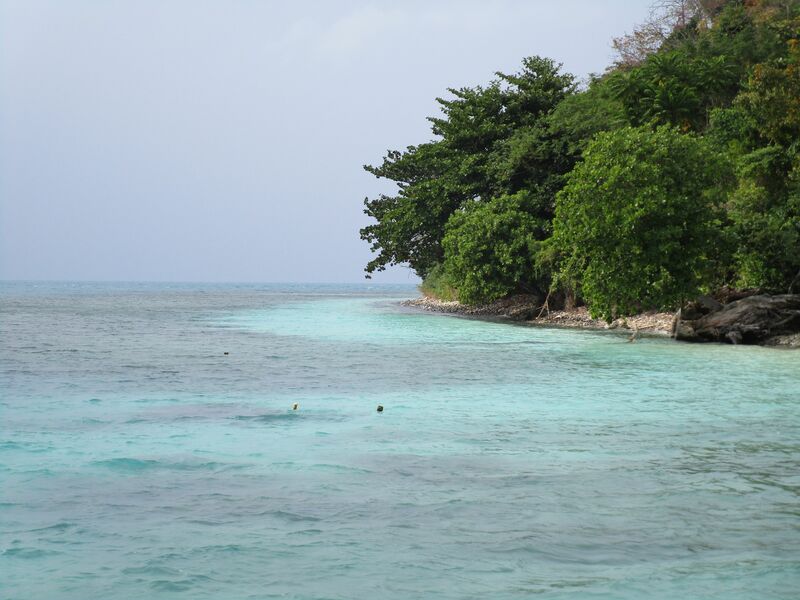 There are several islands on Anambas Islands which is where turtles spawn. 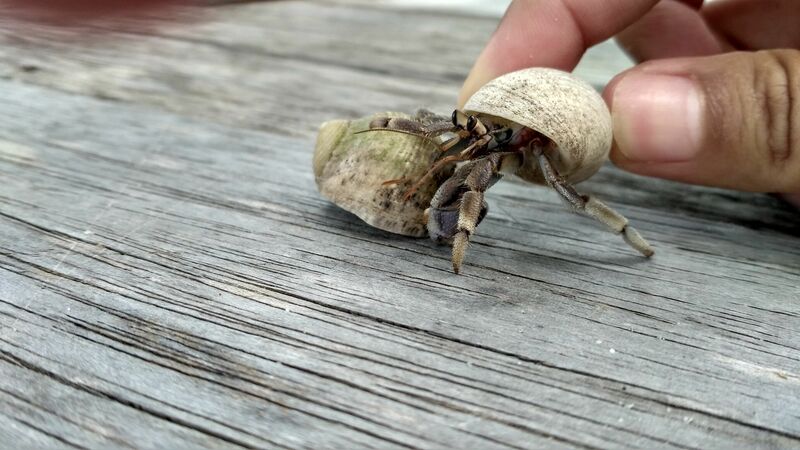 One of them in this Durai island. 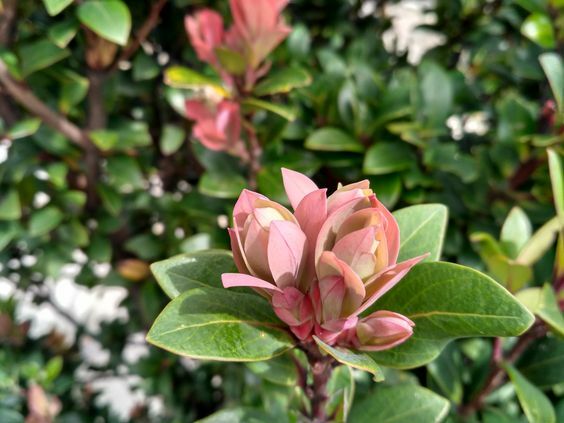 My friend show me about beautiful garden with a lot of flowers in her Instagram. I interest to visit the place. So, my husband and I visited it. The name of that place is Taman Bunga Nusantara or in English we can call it Nusantara Flower Garden. it is a National asset with international scale. This garden is officially informed on 10 September 1995. 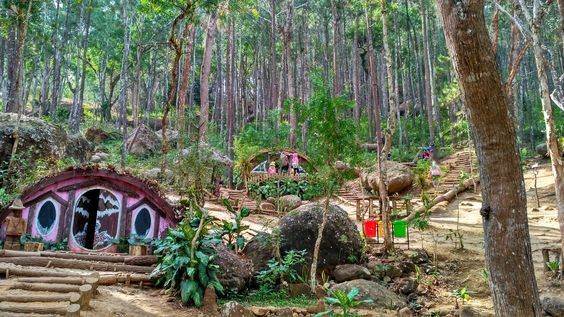 If you want to visit this garden, it is located in Kawungluwuk village, Sukaresmi, Cianjur regency, west Java-Indonesia. To reach this place, you can choose car or motorcycle. It is opened every day, start from 8 a.m. to 5 p.m. for office hour and 5.30 for weekend. This garden is 3 ha wide with 7 imagine garden, villa, and all-purpose building. There is a mascot for tis garden. It is black swam, Cygnus Attratus. The philosophy of the back swam is it is come from Australia. 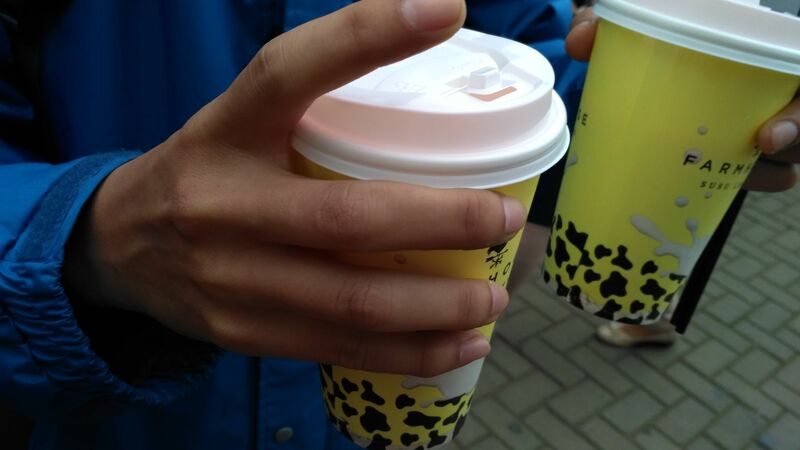 It is very strong, easy to adaptation, rapidly pullulating. A beautiful waterfall with fresh water is a good idea to do on weekend. 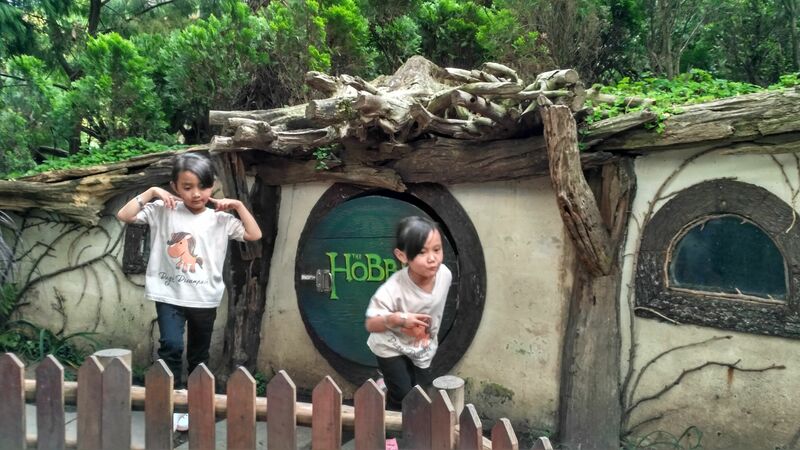 We did it a few months ago, my husband and I searched a beautiful tourism in Bogor. 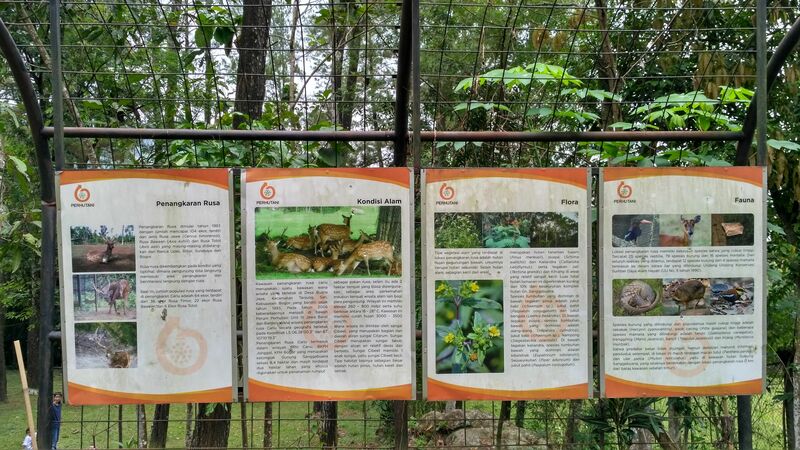 We found many of them, because we like nature tourism. We chose waterfall and there are a lot of waterfalls in Bogor. But many of them are so far from Jakarta and need much time to reach it. So, we decide to go to Bidadari Waterfall, in local language they call it Curug Bidadari. Curug Bidadari is one of waterfalls in West Java. 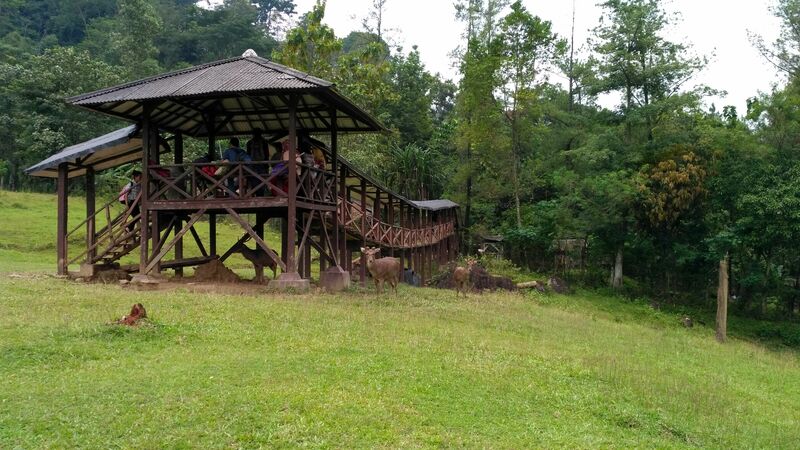 It is located at Bojongkenang village, Sentul, Bogor Regency, West Java-Indonesia. 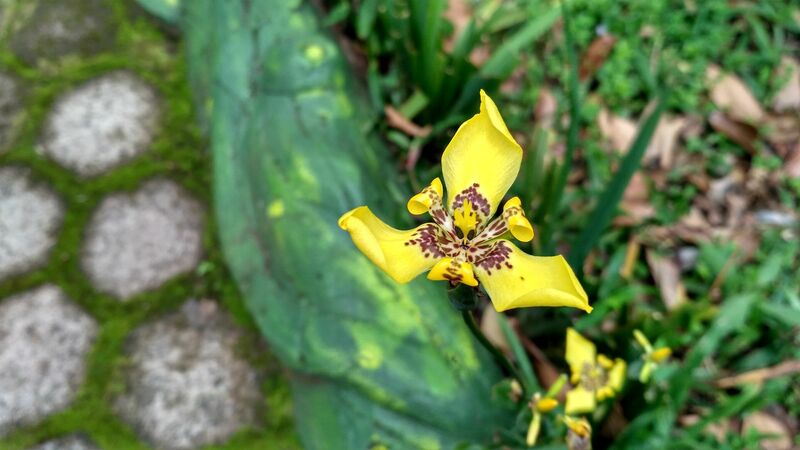 It is in Sentul Paradise Park area. It is about 37 Km from South Jakarta. In English, we can mention the Curug Bidadari with Angel Waterfall. There is a legend about this waterfall. Joko Tarub is a Village youth village. He finds the fairies who was bathing in the waterfall. He peered bathing the angels. Because of the legend, this waterfall is called the Curug Bidadari. Gesing beach is a beach that get us, my husband and I, curious. Four years ago, we have been coming up on the beach. But we did not move on it, because at that time the road leading to the beach is still very quiet and not a single person in that area. Because we hesitate, we decided to cancel the trip and go home. However, curiosity is never disappearing from our memory. So, we decided to go back there again. We hope, we see will be very impressive beach. Gesing beach is one of the beaches in Gunung Kidul Regency, Yogyakarta – Indonesia. 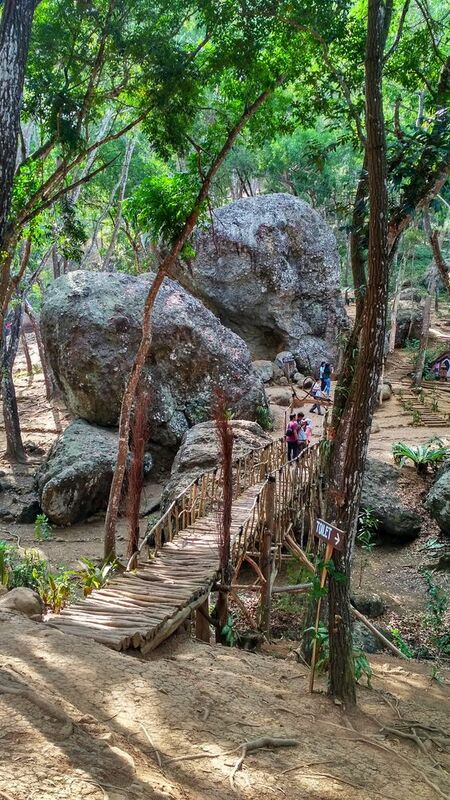 It is located at Padukuhan Panjolomulyo, Girikarto Village, Panggang District, Gunung Kidul Regency. The place is about 40 km from the downtown. To reach to this beach, we can use a motorcycle or car. When we got to the place, we were riding a motorcycle. When we went to the beach, the coastal road is being paved. 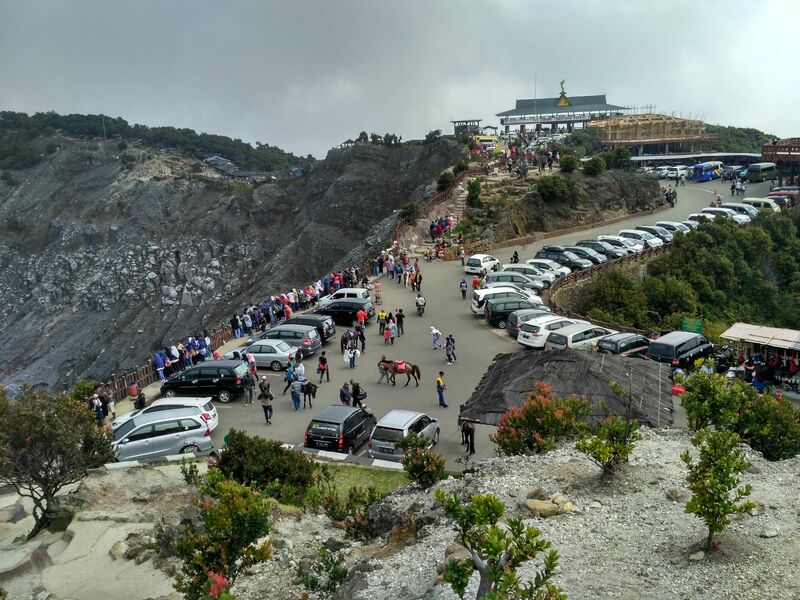 The coastal road is fully paved yet, there are still a few meters of the road rock. So, we have to be more careful. Visiting Seribu Island is one plan that would like my husband and I did. We planned to visit the island to join a tour package. My husband tried to book the tour package. We took a tour that together with another participant. There were more that five people who join this tour package. On Sunday, at 4 am, we went to Muara Angke harbor area. When he arrived at the dock, then we contacted the organizers of the tour previously we ordered via a website. He gave us tickets for the boat ride to get to Tidung Island. After visiting several places in Gorontalo all day, we decided to soak briefly in hot water bathing Lombongo or Lombongo Hot Springs. 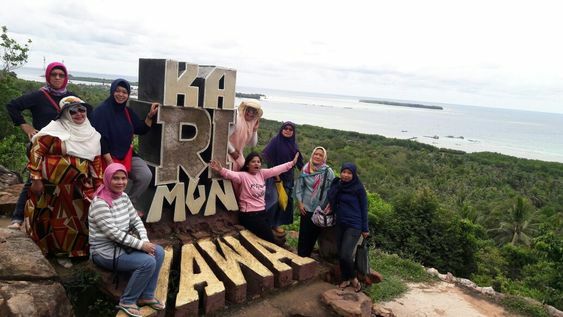 It is one of the natural attractions mainstay of Gorontalo Province which was inaugurated in 1989. The object area is about 32 ha. Lombongo Hot Spring is located in the village Lombongo Lombongo, District Suwawa, Bolango Bone regency, Gorontalo. It is about 19 Km east of the city of Gorontalo. It is the place that was still in the area TNBW (Nani Wartabone National Park). To reach this hot spring, we can use a motorcycle taxi or hire car.